The next step was to move the Hi-Fi back towards the rear wall - to give the loudspeakers even more room. 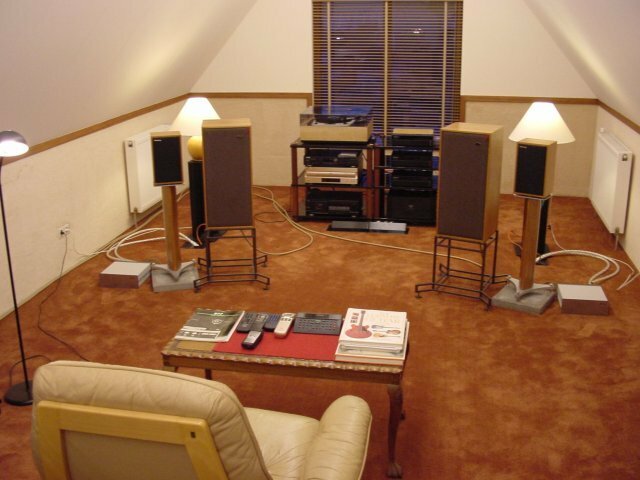 The loudspeakers are placed 3.5 to 4 metres down the room from the rear wall. I normally only have one pair of speakers set-up at any one time. But someone wanted to come and listen to my BC1s and compare with my Stirling Broadcast "reference cabinets" with cicable "reference" crossover on Roger Stone's "tallis" stands. Both pairs of speakers sound magnificent. I normally drive the BC1s from the QUAD "stack" and the LS3/5as from the Meridian stack.